What’s in the Wendy’s 4 for 4? The entrees included in the deal are the Jr. Cheeseburger, the Jr. Cheeseburger Deluxe, the Jr. Bacon Cheeseburger, the Double Stack, the Crispy Chicken Sandwich, the Crispy Chicken BLT, the Grilled Chicken Wrap, and the Spicy Chicken Wrap. Editor’s Note: The square deal welcomes Lindsey Lorenz, Brand Manager of Value, Pricing, and Promotions, who brings the hottest new deals at Wendy’s to customers every day. We’re excited to hear from her on how putting four items together for just $4 became so much more than just a meal deal. Four years ago, fast food value menus were getting stale. No one really had a “dollar” menu anymore, and restaurants that did only offered small or basic sandwiches. I missed the days when a Jr. Bacon Cheeseburger was only $1 – it literally got me through college. It was so clutch, that my friends and I used to talk about “JBCs” as currency. A $10 movie ticket? “I could get 10 JBCs for the price of that!” But that was more than ten years ago and, since then, rising costs and inflation made it impossible to keep a burger like this – with always fresh, never frozen beef and oven baked, Applewood smoked bacon – at just one dollar. Similarly, customers told us for years that they loved Wendy’s value menu because they could build a meal that didn’t break the bank. Grab two Double Stack™ burgers, Jr. Fries, and a Frosty® and you could eat an amazing lunch for $5. But it was getting harder and harder to get good food for that amount of money, not just at Wendy’s, but at every fast food restaurant in America. 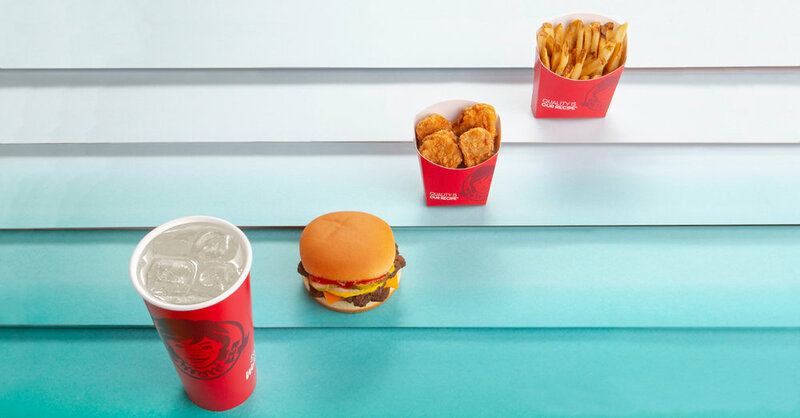 And so, Wendy’s – the fast food brand that created the first 99¢ Super Value Menu in 1989 – went to work on something new that could make eating out affordable again. Enter: 4 for $4. It’s four items for four bucks. Simple math: 4/4 = $1 per item. Get a Jr. Bacon Cheeseburger, 4-pc Nuggets, Small Fries, and a Small Drink with just the $5 bill in your pocket and get some change to spare. And while we knew it was something our customers needed, it became so much more than just a meal deal. It’s the only meal deal cool enough to get its own rap song (that’s actually pretty catchy). So, what started as a simple project to make it more affordable to have a high quality, fast food meal again took on a life of its own. The 4 for $4 even has eight sandwich choices, including the Double Stack, Jr. Bacon Cheeseburger, and even go wraps, to go with your nuggets, fries, and drink. And, no longer do my friends and I lament over when JBCs used to be $1…. We celebrate getting them in the 4 for $4 – and they’re just as good as I remember. Fresh beef available in the contiguous U.S., Alaska and Canada. Price and participation may vary for 4 for $4.